‘You are the Best’ ‘Mum’ cross stitch coaster cross stitch Kit. 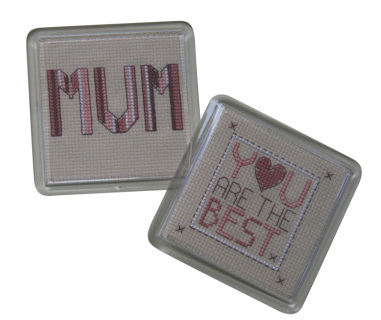 Stitch your own ‘You are the Best’ ‘Mum’ cross stitch coaster set with this adorable cross stitch Kit. What better way to show your mum how much you care that making them a hand crafted gift she can cherish? These pretty keepsakes will be a daily reminder that they are the best! Cross Stitching is a fantastic hobby for both adults and children so if you’ve never tried it before these original little designs are a great way to give it a go. Printed templates that can be place in the back of the coasters to personalise your gift. Although this will make a fantastic family activity, please note that this kit contains functioning needles children will need supervision.